So for this week’s Cheap and Chic of the Week, I thought I would put the spotlight on lighting. Based on previous posts, clearly I think that lighting is really important to a room–and limiting the use of overhead lighting in favor of table lamps is a major portion of creating nice light in a room. 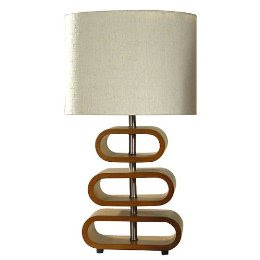 I thought I would check out the often underutilized target website to see what I could find in terms of cheap and chic table lamps, and I thought I did pretty well! Here is the Crystal Lamp Base, for only $19.99! 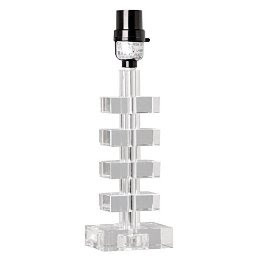 A chic lucite-esque lamp base, Target does not provide a shade, so you can shop for your own. I would go with a crisp, white barrel shade … which you could also most likely purchase from Target. 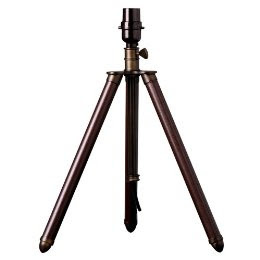 At just $29.99, this Tripod Lamp Base would be perfect in a den or study, or as a desk lamp. I know that other stores, such as Pottery Barn and Restoration Hardware have sold similar lamps before, but never at such a wonderful price! Again, here you get to purchase your own shade, which is often a blessing in disguise, because many of the shades that come with lamps are not attractive. 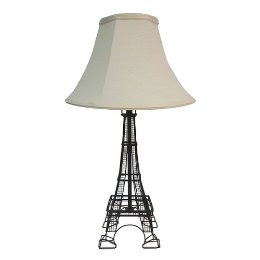 I know this may seem kitschy to some of you, but something about the architectural nature of this Eiffel Tower Lamp, really caught my eye. It has a real vintage feeling, which is often hard to find in a lamp at its price point. This is an example of a shade pairing that just doesn’t work for me. The shade makes the lamp have a more dowdy quality, I would get a more modern lampshade to emphasize the architectural quality of the lamp. And finally, because I have recently been having some sort of affair with mid-century modernism, is this Stacked Geo Table Lamp also for $39.00. In this case, I think that the shade that comes with the lamp is appropriate and works really well. I cannot vouch for the quality of the wood, but you know what? If you don’t like it, lacquer it!